I used to buy a lot of CDs. Indeed, over the course of the past 25 years I have easily reached a thousand CDs. However, my buying habits changed in the late 90's because I felt that I was getting ripped off. I would go out, spend $20 on a CD and enjoy one or two songs. To be honest, the groups being promoted by the big record companies could not produce an entire album of good songs if their life, or the life of the RIAA, depended on it. Fast forward to the digital age and, until recently, this was still very much the case. iTunes made a fundamental change in the buying habits of consumers. Instead of purchasing an entire album for $10 the consumer now had the option of buying the two songs they wanted for $2. The fan is still getting what they want but at a fraction of the cost of what it was previously. Indeed, if you take this into account you see that the numbers the RIAA has painted are not that bleak after all. Let us "convert" digital sales into physical sales. If people only want two songs out of an album of ten, then to convert the digial sale to a physical sale you would multiply by five. Or, to put it another way, if digital sales were not available the music fan would need to spend $10 to get the two songs they want instead of $2. Using this metric (and a few minutes in Excel) you see that the "music industry" has continued to grow in recent years. 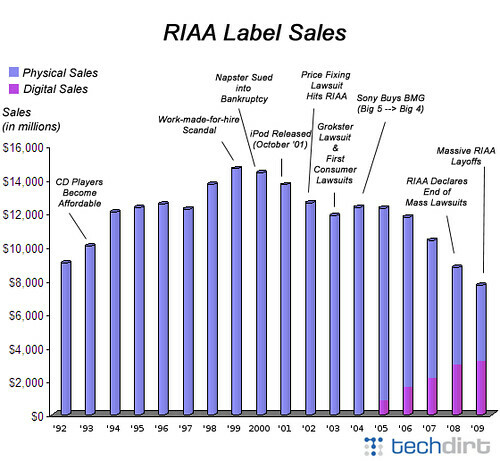 People are still buying the songs they want, but they are buying less fluff and this is where the RIAA has a problem. They produced fluff to pad the good stuff. Now that digital downloads are available the fluff no longer sells. Perhaps the real failure, is the failure of the RIAA supported bands to produce an entire album of good music? I do know that of the last 10 albums I have purchased not a single one has a contract with a major record label and, in my mind, virtually ever song on every album is worth listening to and paying for. Have we reached the stage at which the consumer is able to make more decisions concerning what they need to purchase in order to enjoy a few songs?